Louis Santiago, professor at University of California, USA. "#Whatkillstrees: Drought Survival Strategies of Woody Plants"
Drought-induced mortality and regional dieback of woody vegetation are reported from numerous locations around the world. Yet within any one site, predicting which species are most likely to survive global change-type drought is a challenge. 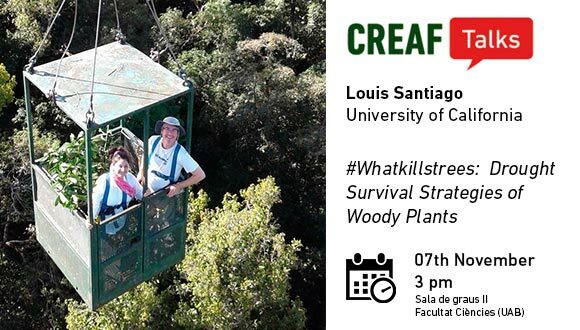 In this seminar, I will discuss the major traits comprising the strategies that woody plants use to survive drought in the context of climate change, including: 1) Cavitation resistant xylem, 2) Capacitance, 3) Deciduousness, 4) Photosynthetic stems, 5) Deep roots, 6) Efficient regulation of gas exchange, 7) Osmotic control, 8) Low cuticle conductance. I will draw examples from tropical forest, Mediterranean-type ecosystems and desert, and discuss new approaches and limitations in our ability to predict drought responses of terrestrial ecosystems. Professor Santiago’s primary research interests are in plant physiological ecology. He has an active interest in determining the role of plant water use in the hydraulic cycles of vegetated watersheds. Professor Santiago’s field research has been conducted in montane watershed forest in Hawaii, in lowland tropical forest in Panama, and in Mediterranean climate ecosystems of California. He employs a variety of techniques including plant physiological measurements, stable isotopes, modeling, environmental sensors, and statistical approaches. Professor Santiago’s academic background includes a Batchelor of Arts from the University of California, Berkeley, a Masters of Science from the University of Hawaii, a Doctor of Philosophy from the University of Florida. In 2006, he joined the Botany and Plant Sciences faculty at the University of California, Riverside as a physiological ecologist and in 2011 was appointed as a Research Associate for the Smithsonian Institution.